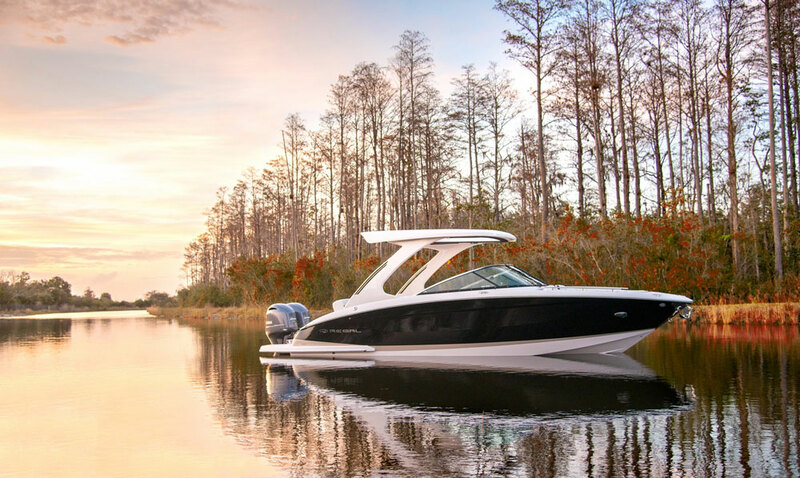 Outboard engines are expanding their appeal to different genres of boats, and with the 29 OBX, Regal introduces their second outboard powered boat. Anyone following the new boat market has surely noticed that outboard engines are encroaching into what was historically stern-drive territory, as we examined in detail in Outboard Engines on Bowriders: A Match Made in Heaven? 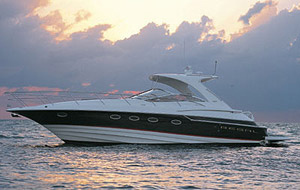 The latest evidence: the Regal 29 OBX, following closely on the heels of the 23 OBX Regal introduced last year. The Regal 29 OBX represents a serious departure from the norm for this builder, which is known for stern-drive boats and has been around since 1969. 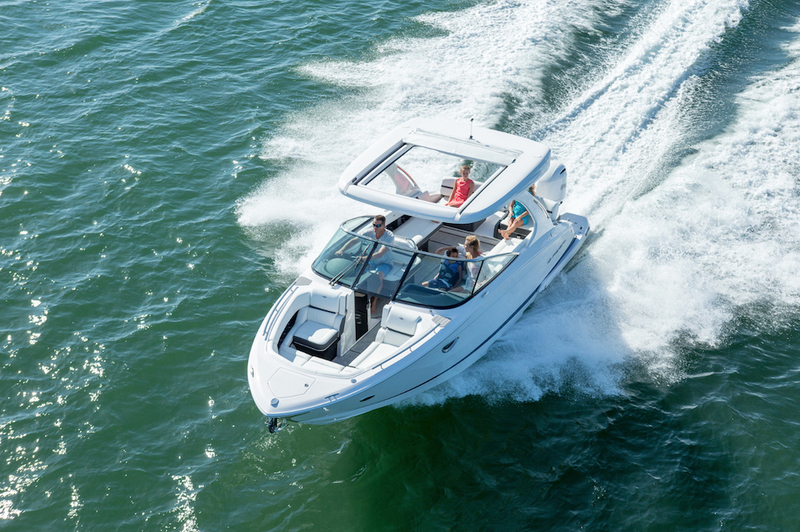 If you haven’t encountered the 29 OBX yet, there’s a good chance you missed it because the boat was overshadowed a bit by Regal’s introduction of the 2100 RX Surf, which made headlines as one of the first boats ever to be fitted with Volvo Penta’s Forward Drive. 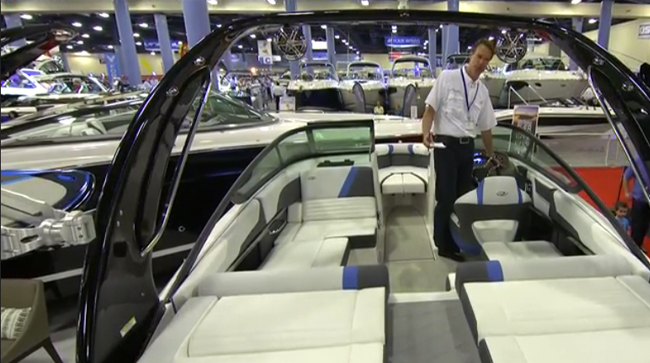 There was also the introduction of the Regal 35 Sport Coupe, a slick, innovative cruiser. If one thing’s for sure, it’s that Regal isn’t resting on its laurels. They’re rolling out new models at a rapid pace, which makes it easy for one to get lost in the shuffle. 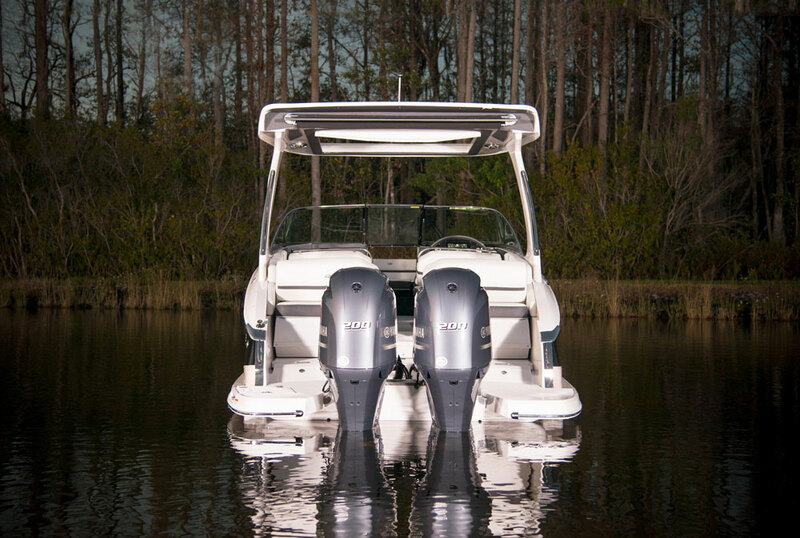 But if you’re looking for a large bowrider and you find outboard power intriguing, you won’t want to let the 29 OBX escape your attention. The attraction of outboards on bowriders can usually be chalked up to a cost savings. When EPA regulations requiring a catalytic converter on stern-drives went into effect, the pricing advantage this power system traditionally enjoyed disappeared. 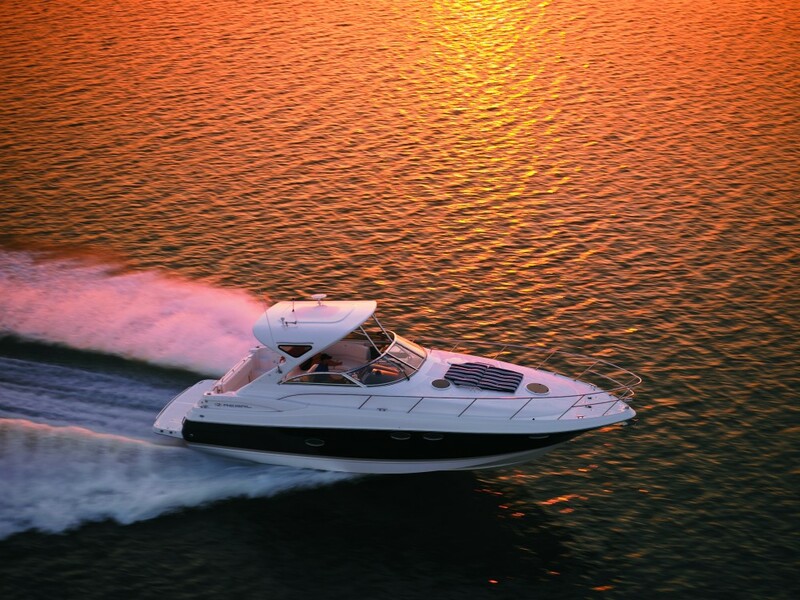 In fact, in most cases outboard versions of the same boat became less expensive. But let’s be real: on a 29’ boat with a price tag that’s well over the six-figure mark, no one’s going to try to save a grand here or there by choosing a different power system. As it turns out, however, there are some other outboard advantages Regal makes use of. Outboard powerplants on a big Regal bowrider? You bet. First, consider weight. A pair of twin Yamaha F200 outboards weighs in at 974-lbs. 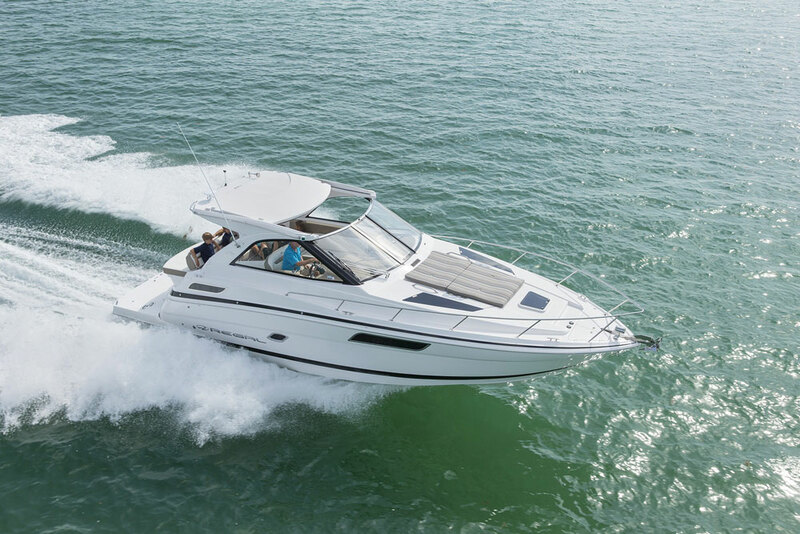 The 380 HP MerCruiser 8.2L V-8 with a Bravo III drive (found in the Regal 2800 Bowrider) is almost 300-lbs heavier—and delivers 20 fewer horses. Along with that horsepower-to-weight ratio advantage comes some extra speed. The 2800 and 29 OBX post the same dry weight, but the 29 reaches a top-end about 2.5 MPH higher, easily breaking the 50 MPH mark. The down-side, on the other hand, is a slightly higher fuel burn. Then, there’s cockpit design to consider. 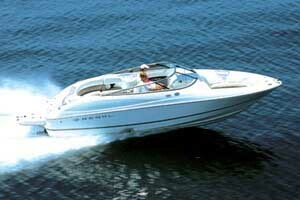 Stern drives require an enginebox, which on runabouts usually creates a natural sunpad at the stern. The absence of this sunpad will, to some buyers, be seen as a disadvantage. But Regal has creatively used this space by mounting a pair of loungers with swing-down backrests on an electric-actuated sliding fiberglass deck plate. In the seating position the whole affair slides back 10” to boost cockpit space, and in the sunpad position you have at least as much room as you would on a traditionally-designed stern drive motorbox, though you’ll recline in a fore and aft position instead of across the beam. Up forward in the boat you won’t find anything radically different from stern-drive bowriders, though the 29 OBX certainly does take full advantage of its relatively large LOA. The passenger’s side console has a roomy head with a sink, cherry trimming, and a choice of a portable MSD or electric commode. One beef, here: the opening port is an option, not a standard feature, and we’d consider it a must-have on any head compartment. The bow has the expected flanking seats, plus swing-down arm rests, a large filler forward, and a mount for a removable dinette table. Stainless-steel cup holders and blue LED mood lighting abound. One thing about Regal—they don’t do things cheap, and it shows in the standard features. The stereo, for example, is a six-speaker 200-watt Fusion system. Grab rails are stainless-steel instead of the more commonly seen plastic. And hatches are RTM (resin transfer molding), which creates lighter, stronger pieces that are fully finished on both sides. If the past couple of years are any indication, we’re going to see more and more of these outboard powered bowriders hitting the water. No doubt, manufacturers like Regal will find new and inventive ways to take advantage of hanging eggbeaters on the transom instead of shoe-horning iron horses into the stern. And if you’re in the market for a new bowrider, you’ll want to pay close attention to these boats—don’t let one like the 29 OBX escape your attention. 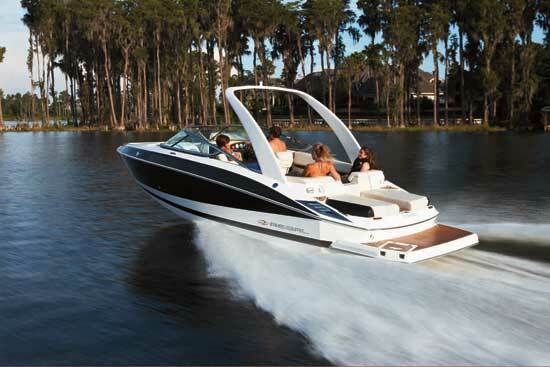 Other Choices: The sterndrive-powered Sea Ray 280 SLX will be a natural competitor, as will the Crownline 285SS. If those outboard seem too attractive to pass up you may also want to look at dual console boats like the Edgewater 280CX, which in truth are extremely similar to bowriders.